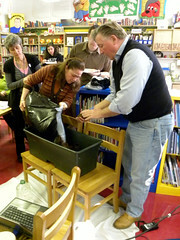 This news is from the recent EarthBox education newsletter. It is about some smart Chicagoans collaborating to promote the use of modern methods to produce local food. The partners are E.A.T., which is an acronym for Education, Agriculture and Technology, Uncommon Ground, a popular Chicago restaurant chain and EarthBox, the leading producer of sub-irrigated portable micro gardens. The Chicagoans behind this collaboration are Ken Waagner, founder of E.A.T. and Helen Cameron, co-founder of Uncommon Ground. Both of them are experienced urban food growers and well versed in using modern methods like the EarthBox whose education program is led by Molly Philbin, a progressive urban food professional. Finding Ken Waagner solved a mystery for me. I wondered how the EarthBoxes appeared on the steps of the Museum of Science and Industry, site of the Smart Home. They were obviously an afterthought. Chicago can thank Ken for the fact that these modern portable micro gardens are now part of the Smart Home. Ken worked closely with The Growing Connection, a UN Organization, to make it happen. Thanks largely to him; the Smart Home and the museum “steps garden” continue to delight Chicago children and parents. Chicago can also thank Helen Cameron for her leadership in growing some fresh food for her restaurants in EarthBoxes along with her custom made planters. Uncommon Ground is now an educational resource for families as well as a great place for them to dine. With the launch of this new program, Chicago will have even more opportunities to grow, learn and eat fresh local food. Read on. Chicago is "growing" by leaps and bounds -- that is, many people are growing their own produce in EarthBox systems and in other gardens as part of a citywide program called E.A.T., which is an acronym for Education, Agriculture and Technology. E.A.T. is centered on using the World Wide Web and technology to connect, inform, and empower individuals with regard to growing food, eating healthier, and building community. Collective Roots is a non-profit located in East Palo Alto, California that advocates local food production. They have discovered the safe and productive benefits of portable micro gardens (aka sub-irrigated planters (SIPs) like the EarthBox. One good example of safe gardening is the nearby Google headquarters (aka Googleplex) garden. It is a joint project of Google and The Growing Connection, a UN organization. They chose to plant the garden in EarthBoxes, one of many portable micro garden options. With safety as the primary goal, the first intelligent step is to have your soil tested for toxic metals contamination before growing any edible plants in the ground. City dwellers around the world are making micro gardens (aka sub-irrigated planters SIPs) from recycled wooden pallets and other scrap lumber. You can find them on rooftops, balconies, small courtyards, alleyways, patios, wherever there is enough sun to grow food. The UN Food & Agriculture Organization (FAO) educates low-income people about how to make what they call "micro garden systems". Think of them as "enabling gardens" because that is what they are. These gardens enable people of all ages and incomes to grow fresh food in their often harsh urban environment. Many of these urban growers end up knowing more about growing food than many professional horticulturists. The big question is why don't you know about them. We will be talking a lot about sub-irrigated planter systems (SIPs) and micro garden systems at the Farm City Fair here in Brooklyn tomorrow. Come on by! Frieda Lim owner of Slippery Slope Micro Farm will share personal experience with her Americanized versions of micro garden systems many of us know as SIPs. While most of the soil-less culture systems require medium to high level investments, FAO has been working over the past years to develop and promote simple, low cost and easy to manage soil-less culture technology adapted for resources-poor urban families with no access to agricultural land. This technology known as "micro garden systems" enables them to grow a broad range of vegetables and condiments on small areas like balconies, roof tops, and patios. Did you know that there was an International EarthBox Day in New York City three years ago? 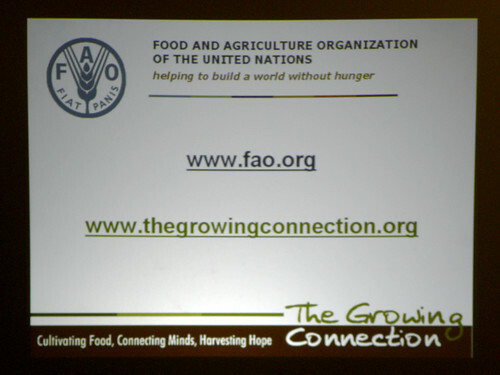 It was sponsored by The Growing Connection, a U.N. organization. What would we do without help from the U.N.? Is that ever a sad commentary on the quality of our horticultural resources. It's questionable how many NYC horticultural educators attended this event about urban gardening modernity. For example, it's hard to believe that the folks at Brooklyn Botanic Garden and New York Botanical Garden still haven't heard about sub-irrigated planters (SIPs) like the popular EarthBox. Tomato Success Kit, Garden Patch Grow Box and all kinds of home made versions but it's true. It is rumored that the string connecting their tin cans is broken. There is nadda, zilch about them in local botanic land. They are still playing in the dirt. We should have an encore remedial event for them. Incidentally, the mayor was spotted at this International EarthBox event sleeping on a park bench hugging a watering can. One of these people is doing much to help feed people living in densely populated urban environments who have little or no access to tillable land. Do you know these two people? Lack of Modern Urban Food Production Information: Extension Program Policy or Ignorance? Why is this such an under publicized story? This is definitely my favorite photo of the urban greenscaping movement. What a great shot. The backdrop of this wonderful outdoor urban theater includes the Smart Home and the Museum of Science and Industry in Chicago. Are there any more important words for the future of America than smart, home, science and industry? Let's add two more critically important words that are also a part of this picture, education and youth. The onstage performers are Cook County Illinois Master Gardeners. The audience sitting on entrance steps to the museum is composed of students. The steps are home to the "EarthBox Smart Garden”. What a complete story in only one photo. There's just one problem and it's a big one. We are not replicating this story across the country or even in Chicago. Someone should answer why this is. There are really just two possible answers, ignorance or unpublicized policy on the part of the Extension Program. Of course, neither of these is acceptable. It is significant to know at the outset that the UN donated the EarthBox sub-irrigated planters (SIPs). Why are we in need of UN aid to do the right thing? What is even more disturbing is that the local extension program is essentially mute on the subject of these modern methods. Unbelievably they appear to be stuck in a bygone drain hole age. Following are links to recent Chicago Extension Program web sites on the subject of edible container gardening. A local extension program educator wrote each of them (one of them is heavily involved in the Smart Home EarthBox garden). Each of them somehow manages to ignore the reality of the very successful Smart Home SIP garden. Read for yourself. Tips For Great Looking Container Gardens - University of Illinois Extension - There Is no mention of “self-watering” planters, sub-irrigation (SIPs) or EarthBoxes, only the usual and tired drainage admoniton. Watch Your Garden Grow – University of Illinois Extension – There is an easy-to-overlook mention of the earthbox (lower case) that links nowhere. It's close to the "must have drainage" dumbness. Without explanatory information it might just as well not be there. Few readers would even notice. See if you can find it. I found it only by using a search feature. We all need to speak up about out-of-date horticultural information paid for by taxpayers. This is particularly true in light of the current campaign to fight obesity, improve nutrition, produce more local food and a perceived need for expensive in-ground school gardens. As is often said, “In a democracy, the people get the government they deserve." This one appears to be stuck in the dirt. This is about the winner of a recent EarthBox gift certificate drawing. If you are not familiar with it, the Earthbox is a sub-irrigated planter (SIP) that is ideal for growing fresh food in urban environments. It's a good business idea to have a drawing for educators (see below) but even better that the winners are supported with a user forum. I also admire the EarthBox relationship with The Growing Connection, (TGC) a subsidiary organization of the UN Food & Agriculture Organization (FAO). Their fine work in support of urban food production education is known by very few Americans. Our media gives TGC little or no credit or publicity for the valuable service they perform here in the U.S. and in emerging economies. 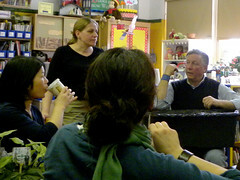 Last week The Growing Connection (a UN organization) officially welcomed PS102 here in Brooklyn into their international network of EarthBox food gardens. TGC director Bob Patterson conducted a most informative presentation and EarthBox workshop for an interested group of teachers and parents. Parent coordinator Margaret Sheri organized the meeting. It was a pleasure to be in the audience. All PS102 students will benefit from the EarthBox food garden. They will learn much about plant science and modern methods of growing food in the city, no tillable land required. They will be in good company with other EarthBox SIP gardens like the Googleplex garden in California and their regional office in Manhattan. Third grade students will also have the opportunity to communicate with students in another country via the TGC network. They will compare notes about their EarthBox SIP gardens as well as learn about each other’s cultures. What a great learning opportunity at such an early age. There are many schools considering the installation of dirt gardens. Instead, I would highly recommend a TGC EarthBox SIP garden as a much wiser investment of time and money. With SIPs all you need is a sunny space, even if it is on concrete or blacktop. There is no need to till the ground (which may be contaminated) or rip up a paved surface. SIPs will produce more fresh vegetables per square foot than in-ground or raised bed gardens while conserving water and time. Since they are portable they can even go to homes during summer recess. More widespread publicity and information about The Growing Connection would save many schools from spending a significant amount of money unnecessarily on in-ground gardens that will not produce as much or teach as much as a TGC EarthBox garden. We could definitely use some "alternative gardening" with sub-irrigated planters (SIPs) like the EarthBoxes here in the Big Apple. The apple would be a lot healthier if we did. Why is the UN Food and Agricultural Organization (FAO) the foremost promoter of SIP food production rather then U.S. institutions? Why is the USDA and Extension Program so uninvolved? There are also many business opportunities and new jobs to be had in this marketplace. In May 2008, Project Medishare began experimenting with 20 of the 220 Earth Boxes which were donated to Project Medishare by the Food and Agricultural Organization of the United Nations (FAO). In partnership with Project Medishare and The Global Institute at the University of Miami, the Institute of Food and Agricultural Sciences at the University of Florida (IFAS) has been providing technical assistance for the Millennium Village Project’s agricultural program. The program is an effort to begin an alternative growing program for the vulnerable (elders, sick, handicapped), children and adolescents. Thanks to Project Medishare’s Agronomist, Ronal Bien-aimé and IFAS’s Florence Sergile the Earth Boxes experiment proved to be a success and has expanded from the trial garden to the clinic in Marmont so visitors and patients can see the possibilities of alternative gardening, and the link between nutrition and good health. Watch this video that few have seen. It features a Google chef and a local master gardener from Santa Clara County. Their presentation of the benefits of EarthBox gardening is persuasive. If you have an open, inquiring mind, you will likely wonder as I do why the news about EarthBox gardening and sub-irrigation (aka self-watering) is virtually ignored by the mainstream media, USDA extension program agents and urban botanical institutions. It is a testimony to our antiquated horticultural education that is stuck in an out-of-date dirt gardening paradigm inappropriate to urban living. It is quite amazing that we have so many academics with master’s degrees and doctorates that apparently do not understand the fundamentals of capillary action and plant physiology, no less urban living. If you think I have some connection to EarthBox, you are mistaken. They just happen to have the most commercially visible product at this time. I have no connection whatsoever to EarthBox. My advocacy is simply about growing food and feeding people in the city using the most environmentally sound and productive methods available. Anyone can easily prove the following for themselves, no institutional help required. Simply plant one or more SIP boxes or buckets this season and you will see with your own eyes. Benefits of sub-irrigation planter (SIP) gardening including the EarthBox, Tomato Success Kit, Garden Patch Grow Box, EarthTainer and all other properly made DIY SIP planters. There is no patent on capillary action. Increased production – SIP vegetable gardening will out-produce all other methods including in-ground and raised beds with drip irrigation. Safe food production – Sub-irrigation box, bed and bucket planters will produce contaminant free food. Unlike dirt gardening in the city, there is no exposure to native soil contaminants. Water conservation – All of the water (and nutrients) go directly to the plants. There is no wasteful drainage. Portability – SIPs can be located anywhere there is adequate sunlight regardless of access to tillable land. Personal, neighborhood and community gardens can be located temporarily and easily moved when necessary. Sustainability – SIPs and the soil mix in them is reusable season after season. Yes, there is an initial cost but they are not consumables. Currently, there are business plans based on a 7-year useful life. Time will tell whether this is an accurate useful life.